The 2007 IBS Score Nationals last weekend (August 18-19), in Canastota, NY, was a hard-fought battle that went down to the wire. 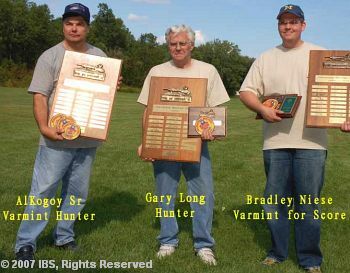 Bradley Niese won the Varmint for Score Grand Aggregate, with a 500-32X combined score, just one “X” ahead of Danny Hensley (500-31X) and Dave Short (500-31X). Bradley was shooting a 30BR with a BAT Action, Bartlein barrel, smithed by Dwight Scott and stocked by Scoville. His winning load consisted of BIB 118gr bullets, pushed by 34.5 grains of H4198 powder and Fed 205m primers. A very skilled and competitive field of shooters–with superbly accurate rifles–graced the firing line at Canastota. The first 13 finishers in Grand Agg rankings all had perfect 500 scores. In the 100-yard Varmint for Score Match, Ken Alfredo, Ken Wood, and Ricky Read tied at 250-21X (ranking third through fifth), and the next five shooters had identical 250-20X scores. That’s tight competition. Al Kogoy Sr. dominated the Varmint Hunter class, winning both the 100-yard match (250-19X) and 200-yard match (248-4X). Al’s 30BR was smithed by B. Green, and featured a BAT action and Hart barrel. Gary Long was “top dog” in Hunter class, winning the 100-yard stage (250-16X) and finishing second at 200 (248-4X), just behind Frank McKee (249-3X). Gary was shooting the 30 Aardvark wildcat with Euber 112s and Vihtavuori N130. Gary smithed his own rifle which had a Hart action and Krieger barrel. For complete match results and competitors’ equipment lists, go to the IBS website, and click on “Match Results” in the left navigation column. Share the post "IBS Score National Results"